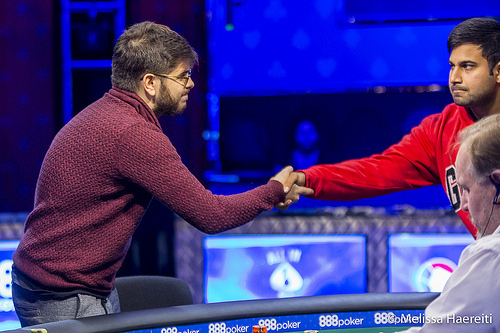 Thiago Macedo raises all in from the small blind for 1,405,000 and Ankush Mandavia calls from the big blind. The flop is , giving Macedo and a flush draw and getting his Brazilian rail chanting for a club. The turn is the , keeping Mandavia ahead. The river is the , no help to Macedo, prompting "USA, USA" chants from Mandavia's and Strelitz's rail, and eliminating Macedo.